I love Google Calendar. I use it at the high school where I work to keep track of teacher reservations for the two computer labs that I supervise. I like that fact that Google Calendar is platform independent; it is web-based and any box (be it Linux, Windows, Mac, or even Chrome OS) can use it. I dreamed that teachers would use the calendar to work out future lesson plans or just check the schedule to see if certain times were available. I built two accounts, one with all the privileges on (for me) and one without any privileges (for the teachers). Well, like the best laid plans of mice and men (English teachers - note the Steinbeck reference), mine failed. Sometimes you can lead a teacher to technology, but sometimes you have to remember that old chalkboard paradigm. At any rate, they do email me with computer lab reservations, which is cool. Most of the time, however, they buttonhole me in a hallway and ask if anything is available next Tuesday. I am old and cannot remember all the details on the schedule on my desktop, so we would have to trek down to the lab and post the reservations. Or the teachers promise to visit me when they have time. They forget to do this and then blame me when they discovered that I assigned the lab to someone else. 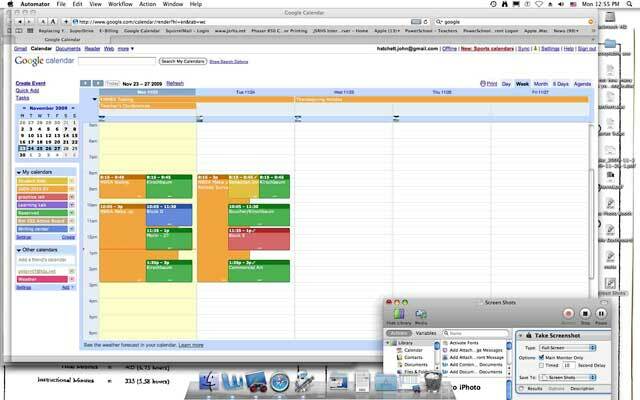 Google Calendar on Mac OS X. Once again, Google was there for the rescue. Our wizard at repair, Mr. Mike, told me about Google Calendar's Sync feature. Everybody in our tech department has an iPod touch (it's not a requirement, but we like to have our tech toys), and we like to share the great programs and features that pop up in the Apple universe. 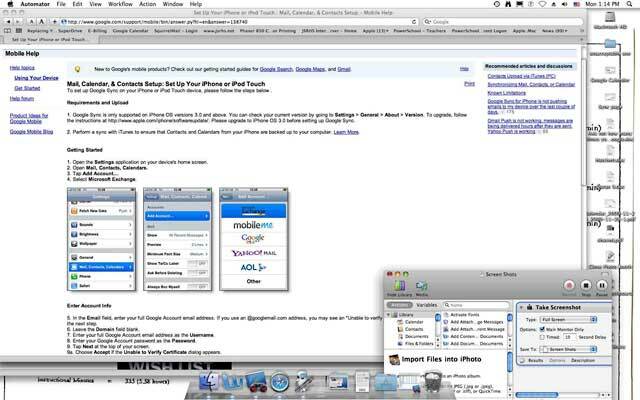 Set up your iPhone or iPod touch to sync with Google Calendar. Synching with Google Calendar is sort of like one stop shopping - you can also set up synching with your Google Contacts and Gmail account. Launch a browser and go to Google Calendar. Log in with your email address and password, then go to the "Google Calendar" page. Select "Sync" and select "iPhone"
Select the "Set up your iPhone and iPod Touch" option. Sync Google Calendar with Outlook, iCal, your iPhone, etc. Your connection with your Google account is in real time. 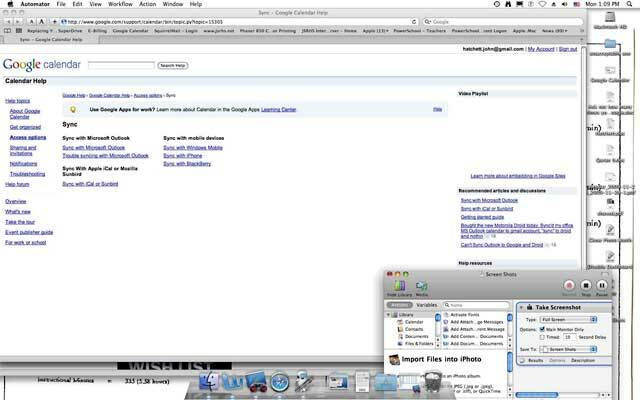 Any changes you make on your iPod are pushed up to the Google "cloud" and subsequently back down to your computer. Coolness. This means that I can make reservations with my iPod (which, of course, I always carry with me) or even cancel reservations or be able to accurately look at future or past events. It's a scholastic miracle!